ELK CITY—Picture this: Winter is approaching. The boat you are sailing on zig-zags every half minute at 30 knots to dodge German submarines. Weeks of sailing around the world, passing locations some can only dream of visiting—Iceland, Liverpool, England—until finally you see the golden grains of Normandy’s beach. The weight of your 75-pound pack tugs on your back as you scramble from the boat, wading through the water; all the while dodging whizzing bullets that scream past your ears. E.L. Fowler served in the army in World War II. “General said if we would have had any place to escape… we would have… we would have escaped into the ocean. But we didn’t have that privilege,” said Edward Levi Fowler, better known as E. L. This is his story. “I was missing for 100 days. Nobody knew where I was,” recalled Fowler who is an Oklahoma native and Baptist Village of Elk City resident. He grew up on the Oklahoma-Texas border. 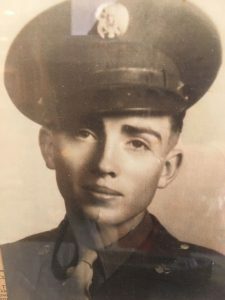 Before the draft, he farmed and married his high school sweetheart of three years, Wilma Perry, after he graduated in 1943. Fowler was drafted into the Army in October 1943, where he served as a Browning Automatic Rifleman. Wilma moved to California where she worked as a real “Rosie the Riveter” in the defense plant. Fowler reported to Fort Sill and was transferred to Camp Wolters, then to Camp Myles Standish and finally to the port of embarkation at Fort George S. Meade. This is where he boarded the U.S.S. Wakefield and eventually landed in Normandy. His company’s objective was to take the city of Saint-Lô. Their mission was expected to take just 10 short days to accomplish. Unprecedentedly, the mission lasted until July 18, when they liberated and secured the city. This was a huge success, as Saint-Lô was the trade center for Normandy. The battalion suffered great losses. Only two-thirds remained. Most were wounded, and of the remaining soldiers, one out of six suffered emotional shock. Two tanks supported by Fowler’s company journeyed too far ahead and were knocked out by German forces. The once strong company fell when the German Panzer Tank Division cut them off from the rest of the troops. All 50 men, including Fowler, found themselves as prisoners of war (POW). The POWs were transferred to East Germany and later Poland. The soldiers were handed picks and shovels and ordered to dig ditches, air raid shelters and water lines for their captors. The coldest winter in 40 years quickly approached. The prisoners’ shoes were worn thin, and their clothes offered little protection from the frigid cold. When the snows came, the men began clearing the railroad tracks. As their imprisonment continued, their minds began to wander to better times and places. It was all they could do to keep their minds off their dysentery and their lice-infested, sore-ridden bodies. Their only nourishment? Watery soup. They savored each drop, trying to make it last longer and seem better than it actually was. The war in Europe drew near an end, and the POWs were marched into Czechoslovakia. After a total of 331 days of imprisonment, Fowler and the other soldiers were liberated in May 1945. “When the war was over, we were on our own,” Fowler recalled. The now free soldiers made their way to the box cars where they rode out to the American lines. Fowler returned home to the states and his loving wife and five children: Charlotte, Vikki, Kathy, Doug and Jill. Fowler’s story and legacy will live on with his family and throughout history. Now at 93 years old, his message and wish to future generations is that they “get in a church and live an honorable life. One that (they’d) be proud of.” Fowler’s faith carried him through the war, and he firmly wishes all believers would never forget that Jesus Christ is Lord. E. L. Fowler is a true hero and true servant of God. View more articles by Sierra Cleverdon.